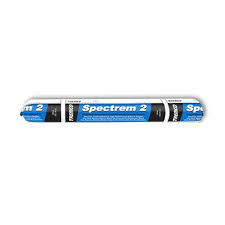 Tremco Spectrem 2 is a medium-modulus, high-performing, one-part, neutral cure silicone joint sealant sausage. Tremco Spectrem 2 has excellent physical properties that makes it very suitable for a variety of perimeter caulking and glazing uses. This silicone sealant is specifically designed for two-sided structural glazing, perimeter and weather sealing. Tremco Spectrem 2 can also be used for cap, heel and toe beads, as well as curtainwall and window joints. Common substrates where Tremco Spectrem 2 can be applied to are steel, aluminum, glass, painted metal, plastic, stone, brick and concrete. Adhesion is obtained without the need of a primer when applied to most construction materials. Only black silicones are recommended for structural glazing applications.